There is no doubt that the disciples of Christ saw him as a man of religious and spiritual authority. It is the status quo to use the statement of Thomas, known as “Doubting Thomas” to illustrate the belief that the disciples viewed Jesus as a deity. In this article, we’re going to employ the same methodology to examine two specific incidents that chronologically follow each other which paints Jesus in a completely human light. The testimony, or rather the alleged testimony of the disciples of Christ in regard to their reactions of Jesus’ statements is perhaps often abused by our evangelical counterparts to enforce the perception of deity. It is in this light, that if we were to use the same line of methodology we’d develop a startling realization due to the disciples’ reactions. The two incidents we’re going to be examining are those of the “Denial of Peter” and the “Sleeping at the Garden of Gethsemane”. We’ll be basing our study off of Mark 14:31-42, Matthew 26:34-46 and Luke 22:34-47. In summation, in gauging the disciple’s reactions to Christ’s statements, while examining the inter-textual development of the Gospel’s narrating of these incidents, we will then be able to draw an educated understanding of the disciple’s perception of Christ. In this scenario we are presented with a peculiar incident. If we assume Peter believes that Jesus is God, here we witness God telling Peter about something which will happen and Peter denying that God’s knowledge is correct. Peter is in essence, standing before God and telling God that he’s wrong. Yet, he’s not merely telling God that God is wrong, he’s emphatically doing so! The anonymous authors of Matthew and Luke saw this as a problem and so we find this same incident purposely altered. This embarrassing scenario could not have happened if Peter truly believed that Jesus was God, for Jesus is the truth, the way and the life. The incident is then tailored to absolve Peter of his blasphemy and/or to deify Christ; if Peter believed Jesus to be a God then he would not have challenged him. 34 “Truly I tell you,” Jesus answered, “this very night, before the rooster crows, you will disown me three times.” 35 But Peter declared, “Even if I have to die with you, I will never disown you.” And all the other disciples said the same. Peter’s challenging of God now never happened! Luke completely removes this incident from ever happening. We must also remember that the Gospel According to Luke, begins with the author declaring that he’s producing a truthful, a more accurate, an orderly account of the events of Christ’s mission. Thus, Luke’s account is a correction of the inaccurate information in the other Gospel accounts. This would then lead us to believe that Luke removes this scenario from his Gospel due to its negative and embarrassing implications. If Peter truly believed that Christ was God, he’d never challenge him and definitely not “emphatically” so. In the Greek of the NA 28, we can see the gradual removal of the word, “emphatically” and then the removal of Peter’s response altogether. 34ὁ δὲ εἶπεν· λέγω σοι, Πέτρε, οὐ φωνήσει σήμερον ἀλέκτωρ ἕως τρίς με ἀπαρνήσῃ εἰδέναι. 35Καὶ εἶπεν αὐτοῖς· ὅτε ἀπέστειλα ὑμᾶς ἄτερ βαλλαντίου καὶ πήρας καὶ ὑποδημάτων, μή τινος ὑστερήσατε; οἱ δὲ εἶπαν· οὐθενός. The same pattern of amendment is found regarding the disciples in the Garden of Gethsemane. In Mark 14:32-42, Jesus finds the disciples disobeying him three times. In Matthew 26:36-46, Jesus also finds them disobeying him three times. Yet, in Luke 22:39-46, he finds them once disobeying his command and that’s it. There is no other mention of Jesus returning to find the disciples disobeying God three times, after God had scolded them. Why then, for a second time does Luke remove entire scenarios of the disciples openly disregarding, disobeying and ignoring Jesus, whom we are expected to believe they viewed as a God? We must critically assess Peter’s actions when Jesus informs him that he will deny Him. If Peter viewed Christ as a God, and God is telling Peter what will happen in the future; on what basis can Peter deny God’s knowledge and emphatically reply that God’s wrong? This seems to be quite absurd. There can be no justification for Peter’s challenging of God, to God’s face. The issue here, is that Peter’s not only disagreeing with Jesus whom he believes to be God, but that he’s emphatically insisting that God is wrong. This would not be a problem, had it not been for the other Gospel authors taking issue with this incident. Both Matthew and Luke were surely embarrassed by this scenario. Surely, Peter whom the Church is built upon as Christ himself declared, must be submissive to God’s commands. Peter cannot be dismissive, he cannot be seen challenging God to his very face. Thus, this incident is embarrassing because it gives the impression that either Peter does not see Christ as a deity (as Peter would never challenge God) or it gives the impression that the disciples were of absolutely weak or little faith and the Church cannot be built upon unfaithful, unbelieving, sinful persons. It is highly unbelievable that in the span of a few minutes the disciples would profess their obedience to a man they considered to be God, would then change their minds and disobey him three times even after he scolded them. They essentially all changed their emotions in regard to him in the span of a few minutes. If God stands before you, commands you to do something, then scolds you for not doing it, then as a person of faith, a person of strong faith, you’d do your utmost best to fulfill God’s commands. Yet the disciples do exactly the opposite, they reject God’s commands and seeing that Christ is in need they all went to sleep. A loved one, the Holy of Holies, God Incarnate stands before you, imploring you to do something and we are expected to believe the disciples decided that sleep was more important? If we were to gauge them by their reactions to Christ’s words and commands, then they clearly seem to be responding to the words of a man and not God. No believer in God would challenge God’s knowledge, no believer in God would listen to God’s commands and then decide to sleep at a time of great importance. If we are to believe that the disciples viewed Jesus as a God, then their reactions teach us the exact opposite, we can quite clearly see they did not have the fear or love of God in them. By examining the inter-textual legacy of the synoptical Gospels, using the evangelical criteria of embarrassment we find clear textual emendation to absolve the disciple’s humanizing, disobeying, rejecting and disbelieving actions and words in regard to Jesus the Christ. The very reactions of the disciples to Christ’s words give the impression that they did not view him as a deity; this is in large part to their challenging of his statements and in their refusal to obey his requests even during his time of need. This is not what we would expect from men who believed God sat among them, lived with them, ate with them and suffered with them. Instead, we find a human Jesus, one whom the disciples could challenge, could disagree with and a Jesus whom they could disrespect and ignore. The very behaviour of the disciples is akin to the disbelieving Pharisees who rejected the Christ who disobeyed him, ignored him and challenged him (cf. Mark 7, Matthew 15, John 8 etc). In conclusion, there are two perspectives we can walk away with after having looked at these incidents from several angles. Either the disciples were men weak of faith, who rejected the Christ and whose behaviour emulated that of the Pharisees or the disciples did not view Christ as a deity as demonstrated by their challenging, disobeying and disregarding of Christ’s commands. Gospel According to Mark: 14:30-31 (NIV). Gospel According to John: 14:6 (NIV). Gospel According to Matthew: 26:34-35 (NIV). Gospel According to Luke: 22:34-35 (NIV). Gospel According to Luke: 1:1-4 (NIV). Gospel According to Mark: 14:31 (NA 28). Gospel According to Matthew: 26:35 (NA 28). Gospel According to Luke: 22:34-35 (NA 28). Gospel According to Matthew: 16:18 (NIV). Gospel According to Mark 14:31 (NIV). Gospel According to Matthew: 26:35 (NIV). This is odd. 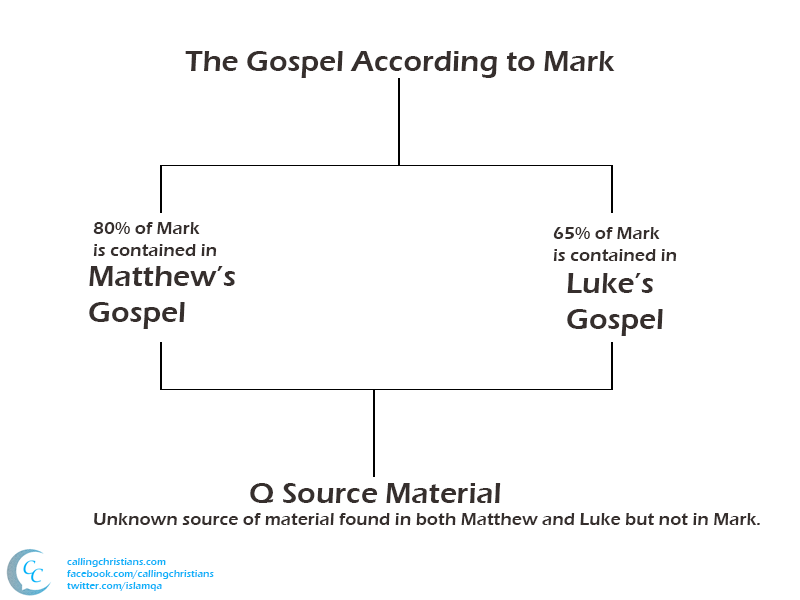 If Matthew and Luke amended the stories from Mark because of the ‘humanising nature’ of their reactions in Mark’s account, and if we assume the Q hypothesis, this would then only serve to demonstrate that Matthew and Luke did believe Jesus was divine, why else modify Mark? By your own argument you have demonstrated that at least Matthew and Luke saw Jesus as divine, even if Mark did not. So either way you slice the pie, we still end up with earliest disciples preaching a divine Jesus. And of course the disciples were men of weak faith and character; the gospels testify to this repeatedly. I agree it’s odd, you’re not following what’s written. My argument is that by altering the statements of Peter and the actions of the disciples, the editors or the later authors of Matthew and Luke were trying to deify Christ. Which would mean it’s a development of the faith, a later addition as opposed to the original humanizing of Christ by Mark. By your own misrepresentation of my argument, you confused yourself. Either way we slice the pie, by your statement, the earliest Gospel (that of Mark) did not see Christ as a deity and the later editors of Matthew and Luke attempted to deify him by means of altering the earliest accounts. So there you go, you just conceded that the belief in Christ as a deity was a development far removed from the original Markan human Christ. Great job! I agree that the New Testament paints the disciples as weak men of faith. On that basis, how can we then rely on their testimony? We can’t, it’s weak by your own admission. A vapid faith. Try reading again. I was agreeing with you! If Luke and Matthew deify Christ (byyour argument), then that is still early testimony that people believed he was God. We don’t disagree on that. A development of faith is hardly a strong argument when one has to assume markan priority as an apriori foundation. Of course, one need not assume your chronology of a markan priority. I could say Matthew was written first, as many a scholar has and continues to do. Can you prove otherwise? Further, it is somewhat of a stretch to argue that because the disciples were lacking in faith, therefore they didn’t believe Christ was divine, nor that Mark has a high Christology based upon *your* interpretation and conclusions of two pericopes. Bauckham and others have shown that Mark has a very high Christology (e.g. mark 6:50). “NO FAITH” is what we get from mark. peter doesn’t get the news of the so called resurrection because the women said nothing to anyone. it doesn’t seem mark was written to tell readers how good peters testimony was, but mark was written against peter and to indicate he (peter) had no testimony . On that basis, how can we then rely on their testimony? i don’t think mark wants anyone to rely on peters testimony. 31He then began to teach them that the son of man must suffer many things and be rejected by the elders, the chief priests and the teachers of the law, and that he must be killed and after three days rise again. 32He spoke plainly about this, and Peter took him aside and began to rebuke him. COMMENT: it is that BRAND new material matthew has ADDED to his account. it is HIGH praise of peter. WHICH suggests. matthew NEEDS peters TESTIMONY. It seems you are talking as though the disciples of Jesus are liars and sinful men, to change Jesus from an ordinary man to divine. It seems to me that you don’t have any record of early Christians that lived in the first century or even the second century that believed in a Jesus that you have recorded in the koran, otherwise you wouldn’t be spending so much time trying to discredit the disciples of Jesus. If you know please let know who the Christians ( sect or group) were who believed in Jesus according to what the koran says. All this stuff about Luke and Matthew changing things and adapting is wearing please confirm the truth of your koran by revealing these Christians. I strongly suggest you take your own advice. You’re saying they (Matthew and Luke) were early views of deification, I’m saying that was a later development after redaction of the Gospel narratives were already in circulation (i.e. not early). We’re, for all intents and purposes saying the opposite thing. So I’m not sure if you’re willingly being daft or you’re trying to spam, but it’s really insipid behaviour to say the very least. A development of faith is hardly a strong argument when one has to assume markan priority as an apriori foundation. That doesn’t make sense. Also, we’re not assuming Markan priority as an a priori foundation. Markan priority is based on philological study and verbal criticism of the Synoptic narrative. Therefore it’s the opposite, its a posteriori. I’m not quite sure if you know what these terms mean, you should click the “apologetics” tab, we have a section on epistemological works by Muslim and non-Muslim authors, I think they’d definitely help you make sense of these terms. Sure you don’t have to assume Markan priority, you could say Matthew was written first but given that we go by the principle of “lectio difficilior potior” and that harmonizations are after the fact, it’s going to be very difficult for you to argue that someone interpolated into Mark that Peter was rivaling Christ, while at the same time someone was editing Luke to remove that incident altogether. That would be a conflicting of interests. If you can reason that out for us, and argue intelligently, I’d be up for that discussion. Paulus, if you’re going to tell me that Christ doing miracles means that the Gospel demonstrates high Christology, then you should know from years of being an online troll and arguing with Muslims and I’m not even going to dignify that with a response. “By Allah’s leave, Acts 2:22, John 5:30”, I’d like to think by now that you would know better than to use such inane reasoning. Maybe I’ve assumed too much of you, perhaps you do have much more to learn. I do not consider the authors of the Gospels to be the disciples of Christ. Therefore I find the later editors and authors of the NT literature to be sinful men who disparaged the truth of Christ and of his righteous companions. There’s no record of any Trinitarian teaching, demigod as modern Christians believe in from the first century. Yet, the beliefs of the Muslims about Christ are during the 1st century CE. How do you explain that? why did matthew remove ekperissōs when he was copying mark 14:31? why did he keep perissōs when he was copying mark 15:14 to mat 27:23? he must have know the word ekperissōs.